If you use a laptop very often then you are fully aware of how hot they can become on the bottom. As a result, the stores are full of devices popularly referred to as “Laptop Cooling Pads” or “Chill Mats”. They are USB powered fans in a portable mat that you place between you and your laptop or on a desktop. They protect your lap from the warm, bottom surface of a laptop and also keep the laptop cool which is important to prevent overheating. This becomes especially important when you are using one of the more high-end models with powerful CPUs and graphics capabilities. Just like their desktop counterparts, these laptops can really overheat quickly. In fact my older Dell Latitude D820 laptop had the nVidia graphics card go bad due to overheating. It was such a problem that nVidia repaired them for free due to a major class-action suit. But how do you keep your laptop cool when it is connected to a docking station? As a software developer my laptop stays turned on and connected to a docking station for days at a time. 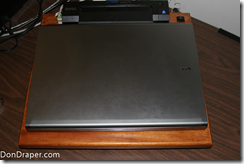 I had addressed this concern by placing an Antec Chill Mat under my new Dell Precision laptop and raising the height of the docking station with a thin book to just the right height. But this was a precarious setup at best and once the fan in the mat went bad, getting the height correct with a newer, thinner mat was not so easy. Suddenly I realized that my docking station and laptop needed to be on a level surface to ensure I did not damage the connector between the dock and the laptop. Placing a chill mat underneath the laptop only simply did not meet that requirement and misalignment could result in damaging both the laptop and docking station. I then pictured an elevated and flat platform that could hold both the docking station and the laptop while having a fan mounted below in some sort of hole. Umm…could something like that work? But what would I use for the fan? I began to research on Google to see how hard it would be to get one of those popular but inexpensive computer fans to be powered from a USB or AC adapter source. I had an extra 120mm Antec computer fan left over from a previous build. Turns out that USB as a power source can work but often did not for many folks that tried. However, using a 12 volt AC adapter seemed to have a high success rate for most folks and I had several of those stored away from previously discarded devices. After testing with a volt meter to be sure the adapter still worked, I spliced the wires and connected it to the 120 mm computer fan as a test. Sure enough the fan worked just fine. This one had a built-in 3-speed switch that would later prove useful to keep the fan from spinning a full speed and therefore much quieter. Next, I decided to build a quick prototype platform that would support the docking station and laptop with a hole for the fan. The idea was for the fan to be mounted below the surface of the platform blowing upward towards the bottom of the laptop. 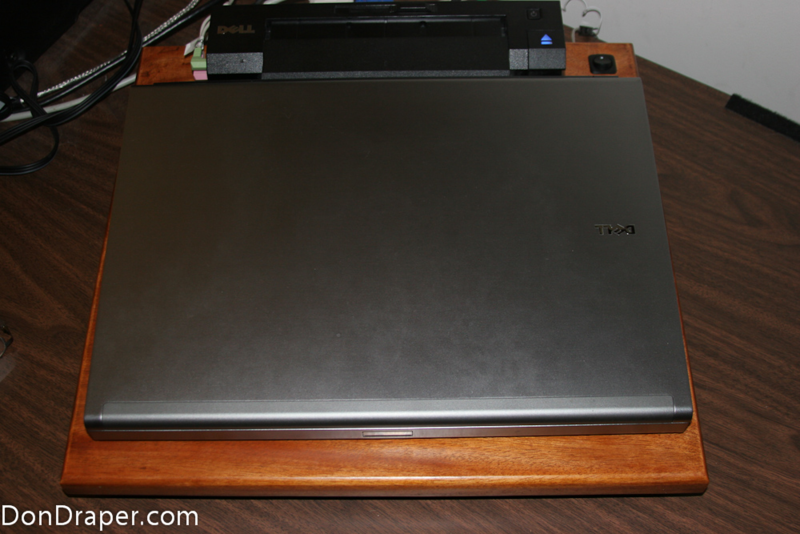 Sort of like a chill mat on steroids, the platform provided a flat surface to ensure a proper angle between the docking station and laptop while the fan was below doing its thing. 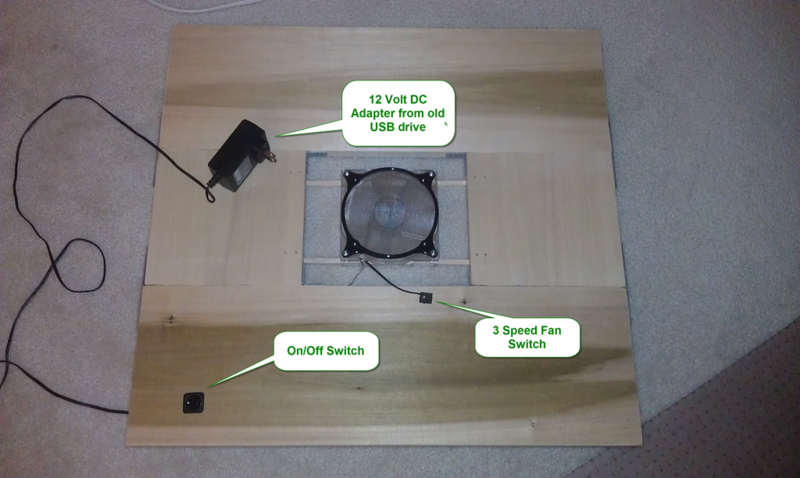 The prototype cooler consisted of 4 pieces of lumber that I simply braced together using metal braces and screws. A quick call to my Father-in-Law who has much experiences in wood working provided the tips I needed to get the prototype built since I did not have wood-working skills. I used rubber feet attached to small blocks of wood to act as legs for the platform. This was needed to ensure the fan would be above the surface of the table with clearance below for air intake. I added a simple on-off switch (SPST from Radio Shack) so I could turn the fan off when the laptop was not on the platform. 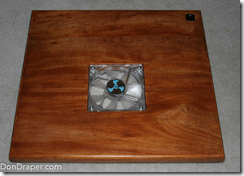 The fan was the simple but popular 3-speed Antec 120mm computer fan mentioned above. Running the fan on the low or medium setting seemed just right and was essentially silent. The prototype was functional but its flaws included being way too big and quite unattractive. My business partner, Krishen Kota, saw the prototype and loved the concept but also knew he had the skills to make the platform much smaller and more attractive. Krishen is not only a geek and marketing guy but also has advanced skills in wood-working. Having a complete wood shop in his basement does not hurt either. So we made plans to meet one evening and build the better mouse-trap. 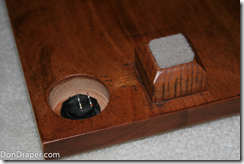 When I arrived, Krishen had already glued some mahogany boards together and tested the surface with an initial stain. We then took measurements on a paper blueprint to scale. This gave us a chance to visualize the size of the platform before cutting the wood. Once we decided on the size and placement for the fan hole, Krishen began his magic. 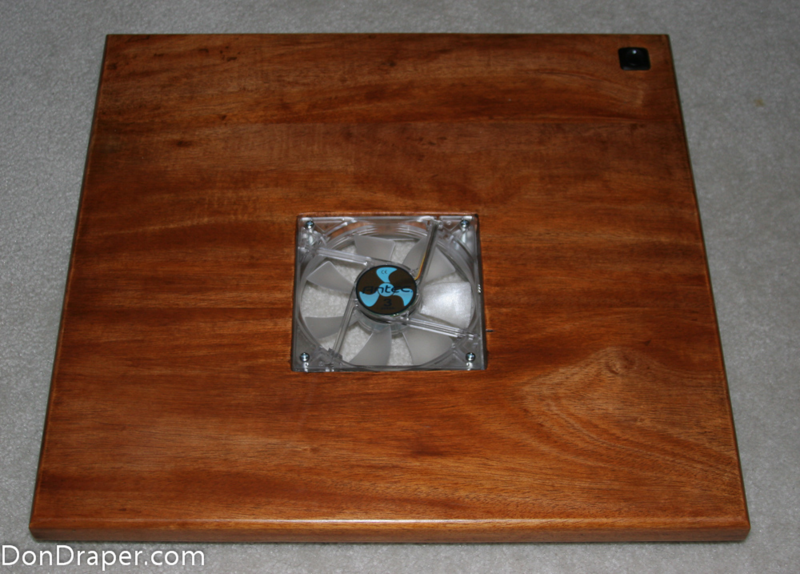 He cut the wood down to the final measurements, then, using a drill-press, drilled four holes so he could then use a jig-saw to cut out the square hole for the fan. Next he took a 1.5 inch square length of wood and cut short pieces that would become the legs. 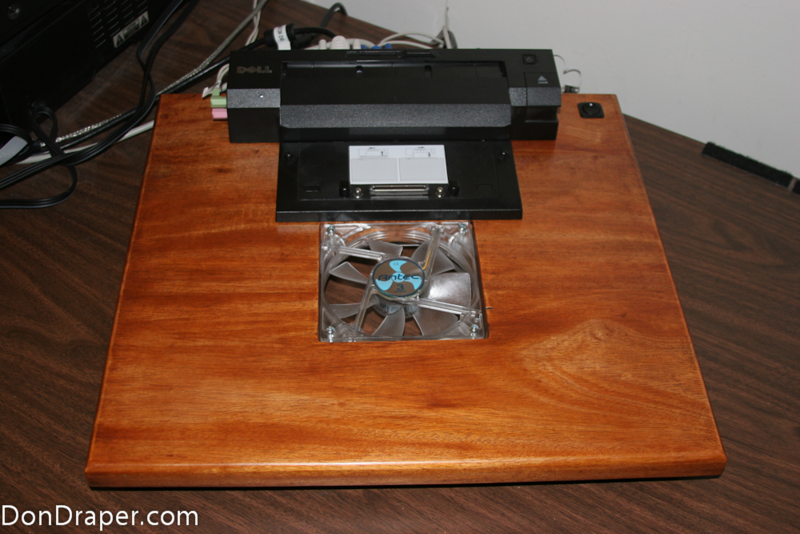 He next used a router mounted on a small table to add a nice beveled edge to the platform and also to each of the four legs. Next he used a drill press to cut holes in one corner that would house the on/off switch. Finally, he glued the legs into place and stained and shellacked the final product over the next few days. He also added felt feet to the bottom of the legs proving a nice scratch and vibration free ride. Once we got back together a few days later, I mounted the fan in the hole, plugged the wires onto the switch terminals and the cooling platform was finished. The AC adapter is wired directly to the fan and one side goes through the switch providing a convenient way to turn off the fan when not in use. As you can see from the photos, the design is very simple but very effective. The 120 mm fan provides ample air-flow to the bottom of the laptop while both the laptop and the docking station have a nice, firm place to rest. The finish is nice and looks like the custom piece of furniture . Many thanks to my Father-in-Law, Rod and my business partner Krishen for their help in getting this creation from the drawing board to the desk top. I am sure my laptops and docking stations will love it for years to come. I’m a Precision user as well., this is my 3rd workstation, been searching high and low for this. I did a custom myself as well. Thiking the base must be alumniium and 3x 80mm fans to blow cold air in from the base. Then additional fans at the rear to help extract air out from the two vents. Please share photos of your solution once completed. Thanks! This is just what I need, do you sell them? Sorry I do not. But if you know of anyone with basic wood-working skills, they could easily build one for you. I have thinkpad t430 that is on series 3 port replicator. Do you have ideas on how I can cool or more as it overheats. “The World is a Book, and Those Who do not Travel Read Only One Page” St. Augustine . Someplace on the Earth. .